Designated smoking areas are an ideal way to allow the use of tobacco and e-cigarette devices without non-smokers facing the health effects of second-hand smoke. The United States is a very different place today than it was just 50 years ago. Smoking cigarettes in the office or while dining with significant others was not just considered normal, it was a show of class, prestige and even social standing. Those days have passed, and with countless scientific studies confirming the ill effects of tobacco use, a compromise has to be reached to allow smokers the freedom to indulge at American River College while not inordinately exposing other students to the health risks. That compromise lies in the creation of designated smoking areas. Sacramento City College, another Los Rios college, enacted a designated smoking area policy on its campus in the autumn of last year, and the results have been stellar. 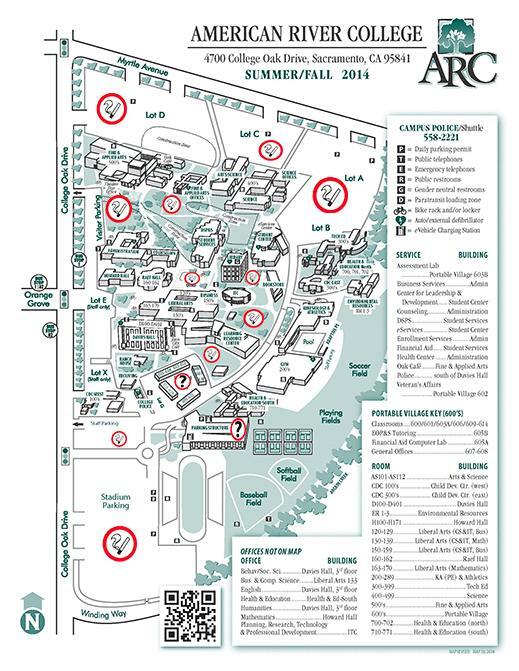 The key to making this approach work lies in careful planning of where the designated smoking areas are to be located on the ARC campus, ensuring students who smoke adequate access to these areas while maintaining a safe distance from those who don’t want to be exposed to secondhand smoke. No student enjoys the thought of rushing to their classes on a sometimes limited time schedule, so strategic placement of the designated smoking areas is essential in ensuring that this approach is successful. If careful surveying, planning and execution is successful, a compromise can make our campus a more pleasant place to be for smokers and nonsmokers alike. In theory, it is most flexible for smokers. Smoking is legal, and other annoyances on campus, like noise disturbances, are not scrutinized the same way. The rule is largely unenforced. Smokers often ignore the rule. Sometimes walking through smoking is unavoidable in more compact areas. If it ain’t broke, don’t fix it. That’s how the old saying goes. But just by surveying the campus, American River College is admitting that at some level, the current policy on campus smoking is broken. Whether it comes from the difficulty of enforcement or not, smokers are ignoring the 30 feet rule. There are different breeds of the campus smoker. There’s the walkers, who stroll through campus with their cigarettes lit, even as they pass open doorways. There’s the rebels, who smoke literally anywhere they want, including right outside open doors. But for the most part, there’s the courteous smoker, who seek out open areas away from people, and move when asked to. So, the question is, are we as a student body, along with the administration, staff and faculty, willing to continue things the way they are? This is why the school commissioned a survey on tobacco, and it will be interesting to see if the administration makes itself beholden to the results. Smoking will be avoidable for non-smokers. Ideally, smoking areas are still convenient and nearby for smokers. It will be easier to officiate than 30 feet rule. Areas might be small and infrequent on busier parts of the campus. Will areas have coverage from elements? Certainly the middle ground between the two extremes, limiting smoking to designated areas on campus would pigeonhole smokers to certain spots for their nicotine fix. 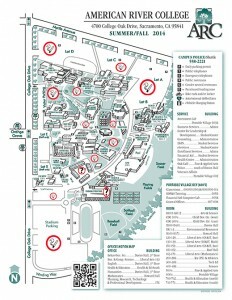 One possible complication includes the size and varying layout of the campus. While the actual size of the campus is much larger than Sacramento City College, and has plenty of space to put things, not all of it is spread evenly. In fact, most of the institutional areas on campus that see the most foot traffic are buildings that are hugged right against each other. So where will they get fit in? Pity to the hypothetical smoker who has a ten minute break between two classes both in Liberal Arts, but faces a five minute walk to and from the potential designated area near Davies. And what will these smoking areas look like? While there’s a debate to be had over whether or not smokers have the right to smoke in an area protected from the elements, it will certainly be fought over as soon as it’s time to pony up the money to create that shelter. 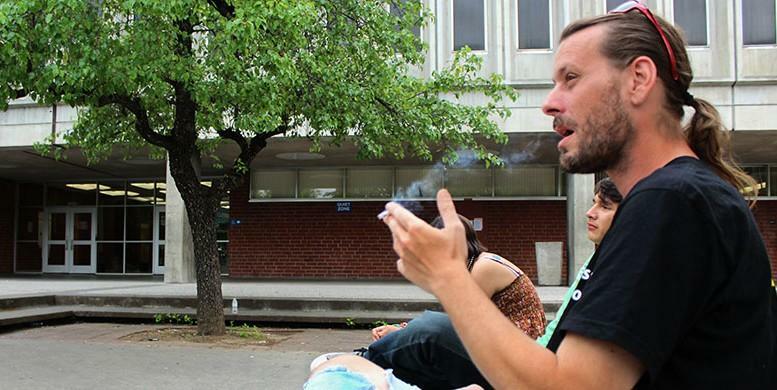 Will every open space on campus be populated by smokers from sunrise to sunset? And will that negatively affect the school experience of students who prefer to spend their between class breaks indoors? No smoking on campus at all for non-smokers. Hooray! Smokers will have less opportunity to smoke frequently, possibly leading to health benefits. It is unfair to treat an annoyance as if it is a crime. It is unaccommodating to students, faculty, administration and staff. Smoking is annoying to non-smokers, no argument there. But are all annoyances created equal? Of course not. According to the Centers for Disease Control and Prevention, secondhand smoke can be every bit as harmful as smoking yourself, and harmful might be understating the matter. Smoking harms nearly every organ of the body, and smoking-related diseases are responsible for one-in-five deaths in the U.S., per the CDC website. So yes, smoking is every bit as annoying as loud music and other bothering things people do on campus. But there is a true, scientifically proven problem with smoking, and the U.S. has continually limited smokers’ ability to light up. In the end, the best way to completely avoid the problems and annoyances brought on by smoking is to not allow people to smoke on campus. 1 Comment on "Editorial: Lift the Smokescreen"
I’m not a smoker, and I don’t want to smell smoke, or vaps, or whatever, when I go to class. I don’t see how smoking is annoying if we’ve proven it causes cancer. Simply do not permit smoking on campus and be done with it. It’s not like LRPD is going to enforce the rules, they don’t enforce the skating rules, bike rules, or anything else. The only thing that is enforced are the parking permit rules…because it makes the school money.